Ladbrokes Poker is a part of the big gambling site Ladbrokes, where you also find sports betting, virtual race betting, finance betting, lotto, bingo and several casinos. The poker room is a part of the iPoker network. You don’t have to leave the poker room at Ladbrokes if you feel like playing casino games, because roughly 70 casino games from Playtech are available right there. This selection includes both table games, slots and video poker. Several of the casino games comes with a progressive jackpot, including Beach Life, Fruit Mania and Gold Rally. 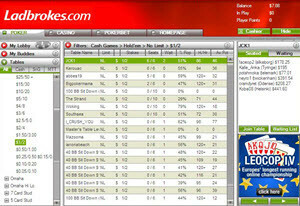 Ladbrokes Poker get their software from iPoker. You can play directly in your browser or download a poker client. Regrettably, there is no downloadable client available for Mac OS; the iPoker downloadable client only works with Windows. Examples of popular features are the enhanced search function, the buddy list, the quick seat option, the auto-top up, the ability to have 15 active tables simultaneously and the multi-table mini-view. 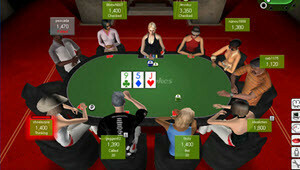 The fast poker variant offered by iPoker is called Speed Poker. Just as with other types of fast poker, Speed Poker will move you to a new poker table as soon as you discard your cards. One of the appeals of fast poker is that you never have to wait for other players to finish up a hand you aren’t involved in. Also, you constantly get to play against new players because even if you stay in the hand until showdown you will be moved to another table when the hand is over. It is possible to play Speed Poker at several tables simultaneously at Labrokes Poker. You simply connect to the same group several times. The system will notice and make sure that you aren’t given more than once seat at each table. As a Ladbrokes Poker member, you gain access to all the iPoker network tournaments, including a larger assortment of scheduled tournaments and Sit & Go’s. Examples of available tournament formats are full ring, short-handed, freezout, knockout, bounty, add-on and rebuy.
. There is for instance a Sunday Special €150k GTD with a €75 buy-in. Satellites are available. If you want to win a travel package to major poker events offline, Ladbrokes Poker is a good destination. In the section of Sit & Go’s, you will find standard Sit & Go, turbo Sit & Go, knock-out Sit & Go and heads-up Sit & Go. There are also the popular Jackpot Sit ‘n Go’s. Why not try the Fort Knox Jackpot Sit ‘n Go, where the progressive jackpot starts at €35,000 or the Rio Jackpot Sit ‘n Go where the progressive jackpot never goes below €20,000? There is also the Ladbrokes Steps Tournament Sit ‘n Go where you can advance through eight steps and reach a Sunday tournament with a €150,000 guaranteed price pot. Ladbrokes Twister Sit ‘n Go’s are turbo Sit & Go tournaments where the entire price pot goes to the 1st place player. Each twister has a randomly decided price pot which can range from twice the buy-in to 1,000 times the buy-in! These means that with a $5 buy-in, you have the chance of winning $5,000 and so on. There is a limit for how many Twisters you can play simultaneously and that limit is six. Since Ladbrokes is a part of the iPoker Network, you can participate in iPoker’s Online Poker Series (iPOPS). Ladbrokes also have plenty of satellites to iPOPS. Mega Poker Series is an offline poker event with satellites available online at Ladbrokes Poker, William Hill Poker, BetBet Poker and Coral Poker. It is possible to win travel packages online that includes airplane tickets, hotel accommodation, buy-in to the Main Event, and more. Examples of Mega Poker Series destinations are Dublin, Barcelona, Malta, Vienna, and Nottingham. Unlike most other poker series, Mega Poker Series is a Deepstack poker series where your Main Event starting stack contains 77,000 chips and the blind levels are 60 minutes and 77 minutes, respectively. When Ladbrokes Poker switched from Microgaming’s poker network to Playtech’s iPoker network it meant a dramatic increase in traffic for Ladbrokes Poker. In PokerScout’s list over the poker rooms and poker networks that has the most traffic to their cash game tables, we currently find iPoker at spot #4, below PokerStars, 888 Poker and Bodog. A majority of the poker rooms in the iPoker network are not specialized poker sites. Instead, they are sites that started out with sports betting and then gradually added more gambling opportunity, including a poker room. This means that a lot of the poker players in the iPoker network has arrived to the poker room after logging in to the site to do sports betting, play casino games or similar. 200% bonus up to a maximum of £1,200. Access to 4 free rolls for new members. Each free roll has a €2,00 price pot. Access to a Depositors Freroll with a €1,250 price pot. Access to weekly new member’s races at Ladbrokes Poker with a €2,000 price pot. When you make a deposit to your Ladbrokes Poker account, you gain access to the next Depositors Freeroll. Register for the Weekly Cash Booster and play for real money at the poker tables during Monday – Sunday and gather status points. For each 100 status points, you will receive €1 in cash, up to a maximum of €50 per week. English language customer support is available 24/7. You can call (+ 44 208 515 2565) or send an email (care@ladbrokes.com). There is also a convenient live chat support available. Free phone # are available form many European countries. Visit Ladbrokes Poker for more information. If no free phone number is available from your country of residence, you can call the UK number listed above but you will need to pay for a call to the United Kingdom. Ladbrokes PLC is one the largest betting companies in the world, and they can trace their history back to 1886 which also makes them one of the oldest still existing betting companies in the world. Ladbrokes still have plenty of business offline, including approximately 2,500 betting shops – most of them located in Great Britain, Ireland or Belgium. Ladbrokes PLC are headquartered in London, but the online business is managed from Gibraltar and has a gambling license from Gibraltar.